Last week, around 40 representatives from research data shared service (rdss) pilot institutions participated in an rdss workshop. There were a number updates on the progress of the service: market research, costing, hiring, contracts, Minimum Viable Product (MVP), engagement strategies. And a few exercises: a temperature check on the project, brainstorming legal and business case challenges; how to engage researchers, what data storage requirements the institutions have and what other use cases such as records management could fit with the service. All in all, we thought the meeting went well, and as always there are a number of take-home messages and actions. 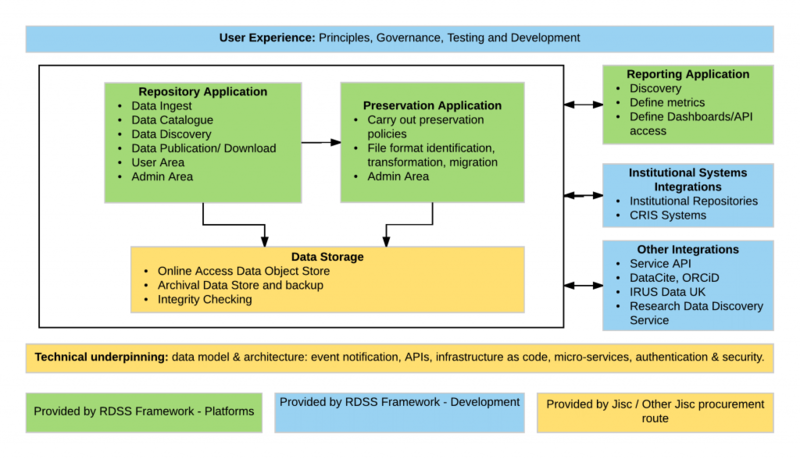 Establishing a solid technical base and evaluating the user experience of these components. Pilots will start testing alpha MVP components from March 2017, with components with longer development paths being delivered for testing in June 2017. The retrospective exercise ran by our new project manager Nick Lonergan, resulted in some really good positives and constructive negatives. One of the messages that came up a few times during the day was in regards to testing the service with the end-users, that is, the research staff, as they will play a big part in determining whether an institution buys into a new service. Expect more on this in the upcoming testing phase. The next pilot meeting will be taking place at the end of May. And the next Research Data Network event is on the 27-28 June in York. See you there! Hello, forgive my possibly simplistic comparison of two services but I was wondering what the differences are in your Research data shared service compared to Mendeley Data? Hi Stuart, that is a very good question. In short, Mendeley Data would be more like a component of the research data shared service. For example we are working with Hydra, Islandora, Arkivum… all of which are platforms managing some aspect of the data lifecycle (preservation, archiving) and our aim is to make them interoperable. John or another member of the team would be happy to have a chat with you and explain in a bit more detail. Please email me daniela.duca@jisc.ac.uk and we will arrange for a call if you are interested.